Whenever you are landed in Forex, there are a lots of quires in your mind on how to earn more while trading in Forex. How to get commission in trading while i am using manual trading or Robot trading. Forex affiliate and IB program can grow from a side income to a lucrative business within several months if you choose right forex referral program and then use it smart. People who are far from affiliate forex partnerships often think that you need to have a website in order to become an affiliate or that the only way to generate forex traffic is by chatting on forums with other traders. Although these methods also work and we will talk about them in details below. There are a lot more ways to make money on forex affiliate program. Some of them require no more than one hour of your time. This topic will be sharing you on how to earn commissions from the broker by using affiliate or IB program. Besides that, You maybe thinking now of recruiting other members to join on your group to be a partner! I can say, Not necessarily to do it. Thus, we will guide you by using Robot robot trading or manual trading you can earn from what you have traded. You can earn from your own trading and at the same time you can also earn from every lot size you traded. Once you Register in a broker firm as an affiliate or IB (Introducing Broker), You will get commission from your few levels of account. You can sign up your first level to 3rd level of account by signing up names within your family members or your friends. Funding that account and make sure to verify those account with the broker before funding it. Register your name with the broker as an IB or affiliate partner. Verified it and complete the necessary documents verification’s with the Broker. Get the affiliate link to register new member. Register new member accounts under your IB / Affiliate group until few levels. check if how many level of commission offered by broker. Make sure to fully verified the new accounts. Fund the accounts on 1st level, 2nd level and 3rd level. this could be better to fund only 2nd and 3rd level. Once done funding, Install our Robot to run 24/5 in a week. Non-stop trading to earn commission. Click and Get the copy here to try the Robot. With the above illustration, If you install Robot on the trading accounts on 1st level, 2nd level, 3rd level. 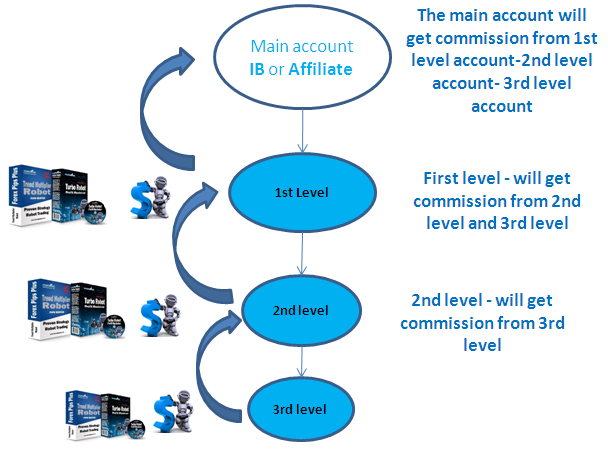 Every accounts will get commission from Main IB/Affiliate account, 1st level, and 2nd level. Every trade lots done by Robot, the above account will get commissions. This will still depends on the Broker you choose and commission percent offerings. There are lots of brokers in the market which offers this wonderful commission strategy and maybe you already having this strategy to earn more. Even your broker has offering this IB or affiliate accounts to attract more traders and to maximize the sales. The commission percentage will depends as well on the broker you choose. 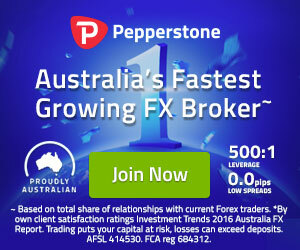 Pepperstone is an online Forex and CFD Broker providing traders across the globe with cutting edge technology to trade the world’s markets. Since 2010, our focus has been to change the way people trade forex. We are driven to provide traders with incredibly low-cost pricing across all FX, CFDs and Commodities with the security of financial regulation and industry leading**customer support. Pepperstone offers a range of online trading platforms including MetaTrader 4, cTrader, WebTrader and mobile apps for iPhone, Android and tablets. Smart traders make smart decisions. Equip yourself with the Pepperstone advantage today. Pepperstone takes pride in a culture of strong regulation and compliance. All client funds are segregated in trust accounts with custodian banks including National Australia Bank (Australia) and Barclays (UK). Pepperstone is authorised and regulated by the Australian Securities and Investment Commission (ASIC) and the Financial Conduct Authority (FCA). Over the years, Pepperstone has won numerous awards including #1 in Customer Service and Overall Client Satisfaction. Pepperstone will bring you a highly personalised customer service experience. Because our team holds years of knowledge and expertise from the forex trading industry, you can rest assured we can always help you pursue your forex trading goals. Commission tiers are determined by country. All amounts listed are in USD. Please see below for more information. We are investing and actively engaged in the development of our own technologies and innovations, which separates us from many of our competitors. Development of our own products – is one of the key features of our company. We are honest to our clients and ourselves. Our high competence and good reputation help us form high trust relationships with our clients, which is especially important for the financial market. We are an international company, which offers services to clients around the world via the Internet. Our employees are located in Europe and in Asia – in order to effectively address the needs of customers from different countries and understand the differences in mentality and culture. We have a deep knowledge of the Forex market. We know its main participants and how they work. Our knowledge is based on our own experience, which allows us to maintain the highest level of professionalism and competency.